Device consisting of a handsaw and a guide for cutting a piece at a precise angle. 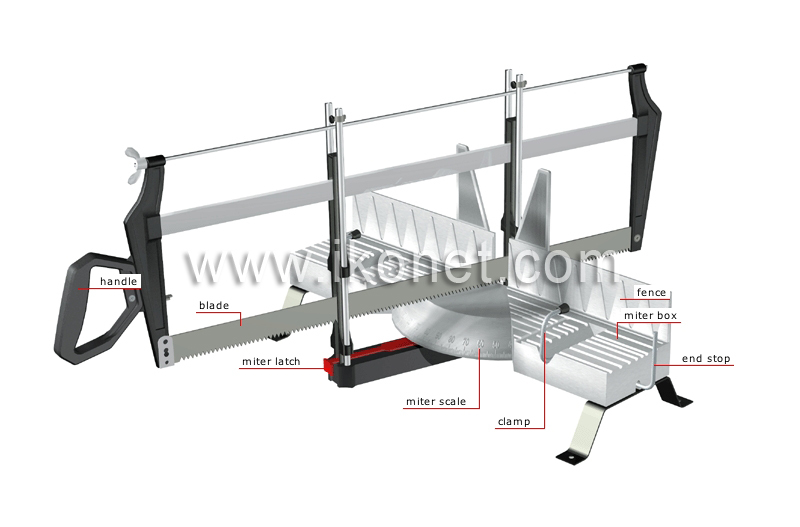 It is set in a rigid frame, which is part of a movable device that moves the blade vertically and horizontally. Perpendicular plate on the surface bracing the piece to be cut. Instrument for locking a piece against the fence and the grooved surface. Adjustable device against which the piece rests to keep it from moving. Graduated scale for regulating the blade precisely to the selected cut angle. Device for locking the blade at the desired angle. Grooved instrument for guiding the saw to make cuts at precise angles.